I am pleased to announce that I just released the Bonita Escape game on our Community GitHub. If you follow the Fresh News series on this blog, you might have seen a screenshot of the diagram. It is a short maze game, that runs in Bonita BPM -- you begin somewhere unknown, and move around until you find the way out. Each "place" on the map is a task in the process diagram. At the end, you will be able to send a victory tweet and enter a drawing to win some Bonitasoft swag! To show that it is possible to learn how to develop a fun application - BPM is not only about "business"! To take the first step to create a series of gamified examples for business and administration instruction. To provide an application that our family and our friends can understand. Sometimes it's not so easy to explain what we do at work, or what our day to day tools as business application developers are all about. Start Bonita BPM Studio, click on "Import", then select the downloaded file. You will see the diagram of the game process. Click "Run" on the cool bar of Bonita BPM Studio. The Bonita Escape game will start in your default browser. 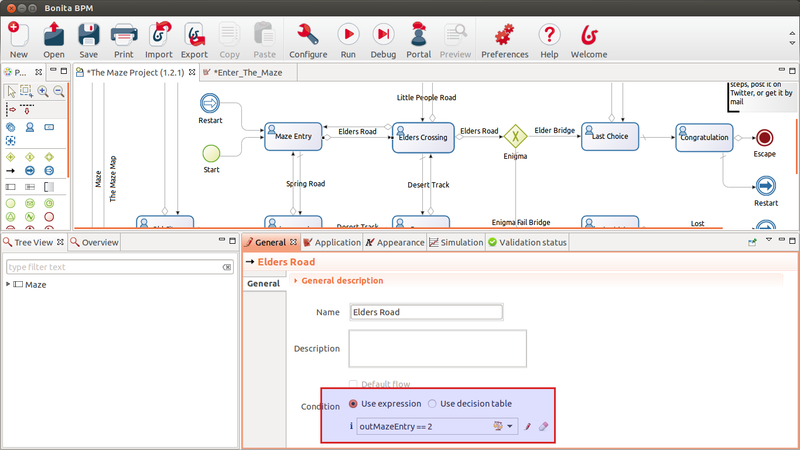 If you are a beginner with Bonita BPM, this the opportunity to start with a fun application. Of course, if you already are an experienced Bonita BPM developer, you will see that application example as pretty simple. All you have to do is import it into your Bonita BPM Studio, and take a small break to test it.